Prominent in this tattoo requested by Lea are water, family and the warrior spirit together with femininity. 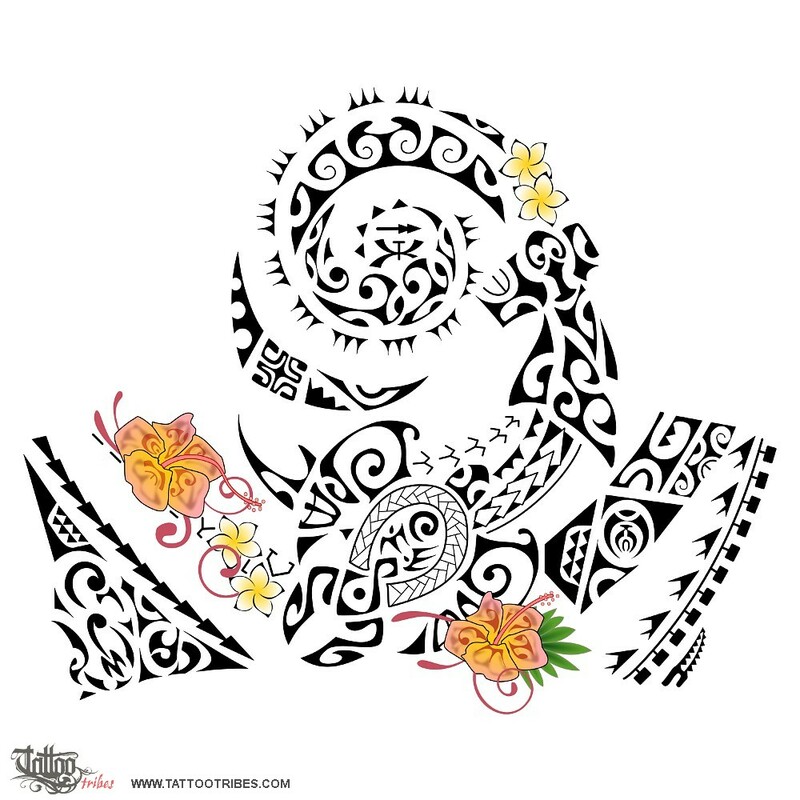 Water is all over the tattoo, with a bigger wave rounding into a sun and encircling the warrior symbol, to recall martial arts revolving around the idea of adapting to every situation to turn it favourable. The warrior is in the center as she embraces the warrior spirit in everything she does. A manta above it is to represent freedom and the sun is for positivity and eternity. The turtle below is the second main element and represents her family. Two tiki on the front fins are for protection. The braid surrounding them all represents their union. The hammerhead shark on the right represents the warrior too, determination and tenacity to face every challenge (the path of Kamehameha). It has a mere in its head for respect, honour and discipline. 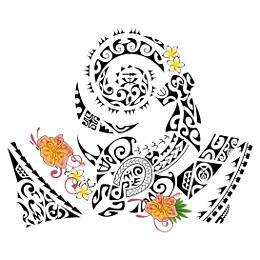 The manaia in the left lower corner is her father with his initials as maorigrams next to it, protecting her from adversities (the moray eel and path of Kamehameha joining it around the arm). Hibiscus flowers represent femininity and positivity towards life, while frangipanis represent love and safe shelter. Birds symbolize the change this way of living has brought to her, teaching her to watch the world from a higher perspective.